Banking on our enriched industry experience, we are able to supply Safety Boot Upper. We are engaged in offering Rigger Boots Upper. It is 100% buff leather, customized as per requirements. It is manufactured from premium grade leather that features durability, gentleness and comfort ability. It is available at the market leading price. Engaged in manufacturing finished leather uppers for industrial safety boots. We make these uppers as per customer's specifications. Safety Boot Upper is a kind of leather product which is used in defense point of view for Army & Military. In the manufacture we are incorporating high quality self made leather. 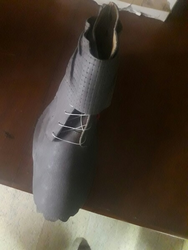 These Leather Shoe Uppers for Army are used by Army, Military, Police, Navy, Air Force etc. The defense people mainly use these type of shoes. 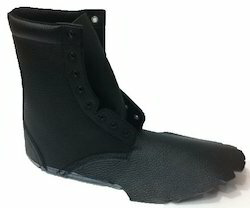 We are manufacturing and delivering the high quality of Safety Ankle Boot Upper. In the manufacture we are including all the latest styles and designs. This is basically a kind of shoe having long heel with colorful lace. These shoes are very comfortable to wear. We offer Safety Shoe Uppers at very affordable price limits. We are a top-notch organization, engaged in providing Safety Boot Upper. We are a top notch supplier of Safety Boot Upper. Enriched by our vast industrial experience in this business, we are involved in offering an enormous quality range of Leather Boot Upper.